Embark on a refreshing retreat at Courtyard Fort Lauderdale Plantation. Our contemporary hotel near Sunrise offers a complimentary shuttle to and from Fort Lauderdale Hollywood International Airport. Soak in the local culture when you visit destinations such as Nova Southeastern University, Westfield Broward mall and BB&T Center. Unwind from adventure in our spacious rooms and suites, which provide for your utmost comfort with complimentary Wi-Fi, plush bedding and ergonomic workstations. Delight in delicious dining at The Bistro, serving flavorful American cuisine, handcrafted cocktails and Starbucks coffee. Make a pit stop for snacks and beverages at The Market. Need to host an event? Utilize our three event spaces and available catering options for your business meeting or social gathering. Before your stay is complete, visit our outdoor pool and 24-hour fitness center for your heart-pumping workout. 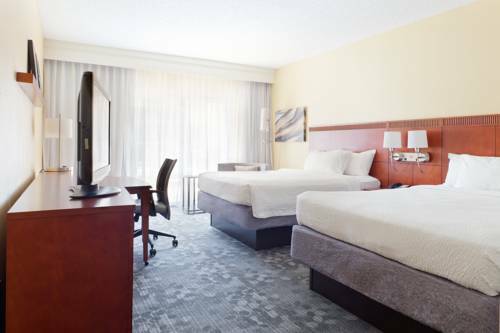 Whatever fills your time with us, step up your travel routine at Courtyard Fort Lauderdale Plantation. Starbucks : We also offer a menu of beverages made with Starbucks coffee, designed to get you through the day.